Here is Lego City set 5627 - Mini Bulldozer. A set of two horses, one goat, various flower bricks and a base plate and two fences. 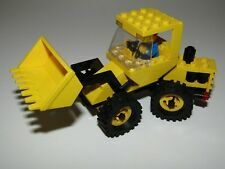 The Lego Bulldozer is in excellent played with condition. The model is complete, with instructions. The instructions are showing signs of wear, see photos and there is no box. The above item is in very good condition. Instructions have a hole punch through the top.